If you are missing one or more teeth, dental implants may be the perfect solution for you! Once you learn about the advantages of dental implants, you will realize that there is finally a way to improve your life. With dental implants, Dr. Herman can offer replacement teeth that look, feel, and function as wonderful as natural teeth. They can be your doorway to renewed self-confidence and peace of mind. 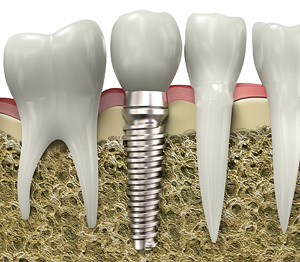 Dental implants fuse to the jaw bone to form a secure foundation for tooth replacement. They are made of titanium metal and function as the root of a tooth. They provide a strong foundation for crowns, bridges, and dentures. With good oral hygiene and regular dental visits, dental implants can last a lifetime. Unlike removable dentures, implant supported dentures fit perfectly, and you won’t have to worry about them slipping or feeling uncomfortable. Some denture wearers, or those with missing teeth, find it difficult to eat certain foods. With dental implants, you can have the foods you’ve always enjoyed! Approximately 49% of americans between the ages of 18 and 64 are missing at least one tooth. No one can be disqualified for implant treatment solely because of their age. Some patients receive implant treatment when they are in their nineties! Dental Implants are placed under local anesthesia with little to no discomfort. If you are considering a dental implant, contact us for a free evaluation. Dr. Herman and his knowledgeable staff will help you learn more about implants and what they can do for you!